Even those with a passing knowledge of poetry, history or literature know at least some of the words: “Their’s not to reason why, Their’s but to do and die…Cannon to right of them, Cannon to left of them…Into the valley of Death Rode the six hundred”. The words are from Tennyson’s immortal poem, The Charge of the Light Brigade, written shortly after the event that inspired them – The Battle of Balaclava, which took place on October 25, 1854. What started as a dispute between Roman Catholic and Orthodox Christian sects over control of Christian holy places in the Ottoman Empire escalated into Czar Nicolas I declaring himself the protector of ALL Christians in Turkish lands. That, in turn, led to the Russian encroachment of the Turkish lands – again, under the pretense of “protecting Christians” – which led to a clash of arms between Russia and the Turks. After the Russian Black Sea fleet annihilated a Turkish fleet in November, 1853, the die was cast, and Britain felt she had no recourse but to go to war to check the southern expansion of the Russian Empire. Thus began the Crimean War. Part of the British Calvary Division, the Light Brigade was commanded by Lord Cardigan, one James Brudenell. As was the norm at the time for some officers, he had bought his commission. The Calvary Division – consisting of both the Heavy and Light Brigades – was commanded by George Bingham, the Earl of Lucan. Lord Lucan had also purchased his commission. Additionally, Lord Lucan and Lord Cardigan were related by marriage – and fierce enemies who were inclined not to speak to each other. This situation would have disastrous consequences. After a hazardous journey east, one which resulted in multiple stops and the loss of almost 60 horses, the Light Brigade arrived in the Crimea in September, 1854. The British and French objective was the of capture Sevastopol and the elimination of the Black Sea Fleet. Moving on Sevastopol from the north, the Allied and Russian armies clashed briefly at the Alma. After the Russians were repulsed, the Allies continued onto Sevastopol, which was undefended. However, the Allies didn’t realize this, and wishing to avoid casualties, they circled around to take the city from the South, which they thought would be the more lightly defended approach. Once they had circled to the south, the Calvary Division encamping at a place called Balaclava. The rest, as they say, is history…into the Valley of Death rode the six hundred. Most of what people considered to be “true” about the Charge of the Light Brigade is taken from Tennyson’s poem. Brighton’s book looks at the Charge and tackles the prevailing myths – what happened that day, why it happened, and the historical view of the success or failure of the ride. At the end of the book, he also takes a hard look at the other legend to come out of the Crimean War – that of Florence Nightingale. I had this book in my stash of things to read for almost a year before picking it up – once I started it, I was sorry I didn’t read it sooner. 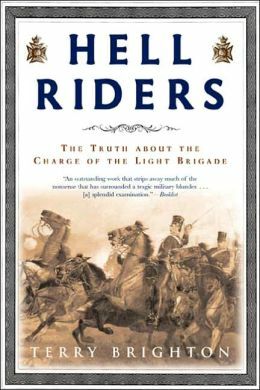 The Charge of the Light Brigade was an event that never should have happened – it was one of the biggest – and most widely celebrated – blunders in military history. Brighton does a nice job of bringing the characters, the background and the story to life. I found it a fascinating read, and highly recommend it.